North America has a wide variety of climate conditions, representative of nearly all the major regions of the world. The characteristics of the climatic regimes range from the polar ice cap in the far north of Canada to subtropical conditions in the southern United States. It encompasses arid sections of the western United States to humid regions of the eastern United States. The diverse climate zones, topography, and soils support many ecological communities and supply an abundance of renewable resources. Because of this broad diversity, the effects of changing climatic conditions cannot be oversimplified. Consequently, extensive research has definitely sharpened the focus on trends, impacts, vulnerability, and adaptability of agriculture and forestry to these changes. Observations over the past century have revealed some interesting trends in U.S. climate. National temperatures, on average, have increased by about 0.6 °C. Regionally, the coastal Northeast, the upper Midwest, the Southwest, and parts of Alaska have experienced increases in annual average temperature approaching 2 °C over the past 100 years. The Southeast and southern Great Plains have actually experienced a slight cooling over the 20th century, but since the 1970s have had increasing temperatures as well, the largest observed warming across the nation has occurred in winter (National Assessment Synthesis Team, 2000). Focusing on growing season variability in the heart of the Corn Belt, Iowa is the leading corn-producing state in the United States. 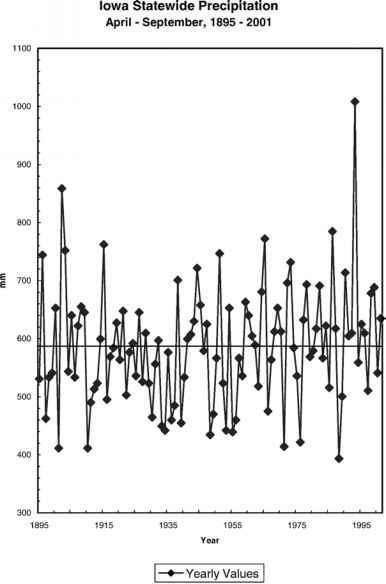 Figure 1 shows the historical time series of seasonal temperature during the growing season, April to September, during the period 1895-2001. The temperature pattern is quite variable over this time period but there is no clear evidence of warming. However, agriculture was likely impacted by the relatively high degree of temperature variability exhibited throughout the entire period. Figure 1. Iowa statewide temperatures (°C) during the growing season, April-September, for the period 1895-2001. Filtered values from a smoothing procedure, computed by NOAA National Climatic Data Center, and the long-term mean value also shown. Source: National Climatic Data Cen-ter/NESDIS/NOAA. minimize the urbanization effects include the creation of data sets using a minimum population-based threshold, and, analytical comparisons of soil temperature data at totally rural sites with contemporary air temperature records at nearby towns. 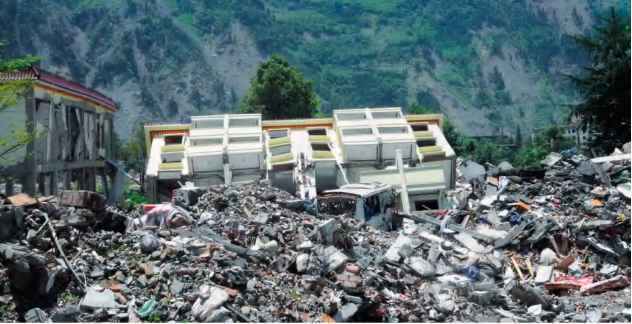 Both methods are able to discern an urban warming bias in climatic records (Changnon, 1999; Dow and DeWalle, 2000). Figure 2. Iowa statewide precipitation (mm) during the growing season, April-September, for the period 1895-2001. Filtered values from a smoothing procedure, computed by NOAA National Climatic Data Center, and the long-term mean value also shown. Source: National Climatic Data Cen-ter/NESDIS/NOAA. Figure 3. Annual national temperature departures and long-term trend: 1895-1996. Source: Environment Canada 1999, p.3. in this period of record occurred in 1988. The wettest summer growing season occurred in 1993, a year of record flooding in the U.S. Midwest. In Canada, the average annual climate has warmed by about 1 °C compared to the associated global warming of 0.5 °C. Figure 3 shows the annual national temperature departures and long-term trend, 1895-1996 (Environment Canada, 1999). Regional variations range from a warming of about 1.5 °C in the Northwestern Territories (N.W.T. ), to a warming of less than 1 °C over southern Canada, and to a cooling of 0.8 °C in extreme eastern N.W.T. (Environment Canada, 1997a). Consistent with the global precipitation trend, Canada as a whole has also experienced increased annual precipitation (Figure 4). Changes in the mean annual temperature regions of the boreal forests between 1895 and 1994 show a general increase ranging from 0.5 °C over the Northeastern Forest to 1.4 °C over the Northeastern Forest to 1.7 °C over the Mackenzie District (Figure 5). Zhang et al. (2000) analyzed trends in Canadian temperature and precipitation during the 20th century using recently updated and adjusted station data. Six elements, maximum, minimum, and mean temperatures along with diurnal temperature range (DTR), precipitation totals and ratio of snowfall to total precipitation were investigated. Trends were computed for 1900-1998 (period 1) for southern Canada (south of 60 °N), and separately for 1950-1998 (period 2) for the entire country. Figure 4. Annual national precipitation with weighted running mean: 1945—2001. (Source: Climate trends and variations bulletin for Canada. Annual 2001 temperature and precipitation in historical perspective. Source: Environment Canada 2002/2003. Climate trends and variations bulletin for Canada, Annual 2001 temperature and precipitation in historical perspective, p.3. Environment Canada, Meteorological Service of Canada, Climate Research Branch. Study (CCS) for 1895-1996, whereas those for the shorter and more recent period 2 for the entire country show a somewhat different pattern. From 1900-1998, the annual mean temperature increased between 0.5 °C and 1.5 °C in the south. The warming is greater in minimum temperature than in maximum temperature in the first half of the century, resulting in a decrease of DTR. 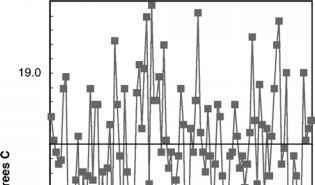 The greatest warming occurred in the west, with statistically significant increases mostly seen during spring and summer periods. Annual precipitation also increased from 5% to 35% in southern Canada over the same period. In general, the ratio of snowfall to total precipitation has been increasing mostly due to the increase in winter precipitation which generally falls as snow and an increase of ratio in autumn. Negative trends were identified in some southern regions during spring. Figure 5. Temperature deviations in three regions of boreal forest: 1985-1994. Source: Criteria and Indicators, Criterion 2: Ecosystem condition and productivity, Element 2.1 Disturbance and Stress, Fig. 2.1n, p.36. negative trends found in southern regions during winter. Overall, the ratio of snowfall to total precipitation has increased, with significant negative trends occurring mostly in southern Canada during spring. Zhang et al. (2000) concluded that climate has been becoming gradually wetter and warmer in southern Canada throughout the entire century, and in all of Canada during the latter half of the century. In another study of precipitation characteristics in Canada during the past century, decadal variability was found to be a dominant feature of both the frequency and intensity of annual precipitation (Zhang et al., 2001). The observed upward trend in precipitation totals was mainly due to increases in the number of small-to-moderate rainfall and snowfall events. There appears to be upward trends over eastern Canada and in the number of heavy snowfall events for autumn and winter over northern Canada. Similar findings were also reported by Akinremi et al. (1999) from studies on precipitation trends at 37 stations with 75 years of records across the Canadian prairies. The analysis showed that there has been an increase in rainfall amount, an increase in the number of events, and a decrease in the variance of rainfall within the last 75 years. However, snowfall has declined from 1961 to 1995. 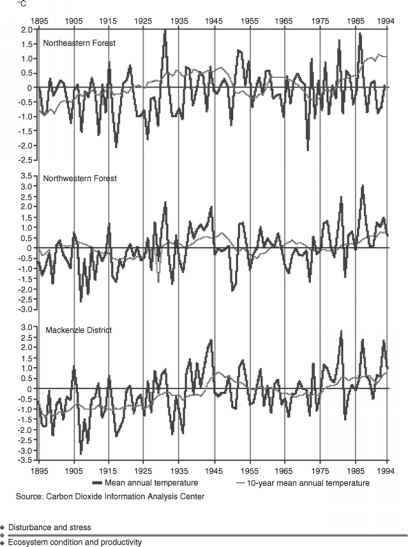 The difference in trends for snowfall between period 1 (1921-1960) and period 2 (1961-1995), combined with the inverse relationship in the rainfall-snowfall trends, suggests that these trends may be related to climate change. 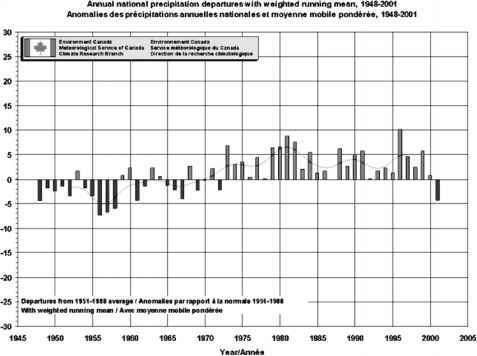 Precipitation seems to have increased and become more variable over the past 100 years (Bootsma, 1994, 1997). This may have impacted agriculture through reduced drought stress but may have increased problems in coping with excess moisture. Increased variability may have resulted in greater fluctuations in crop yields in recent decades. While long-term changes in precipitation are statistically significant, they are still relatively small in comparison to the year to year variability that growers must contend with (Bootsma, 1997). Soil moisture is critical for both agriculture and natural ecosystems. While observations of soil moisture are wholly inadequate for analysis, there is a good understanding of its relationship to climate. Soil moisture levels are determined by an intricate interaction between precipitation, evaporation, run-off, and soil drainage. Precipitation is the source for soil moisture. However, higher air temperatures increase the rate of evaporation and may remove moisture from the soil faster than it can be added by precipitation. Under this scenario, a region would become drier even though rainfall increases. These conditions have been observed in portions of the Great Plains and eastern seaboard, where precipitation has increased and air temperature has risen. Bootsma's conclusions are substantiated by the trends computed for 1900-1998 for southern Canada reported by Zhang et al. (2000) viz. an annual mean temperature increase between 0.5 °C and 1.5 °C and an annual precipitation increase from 5% to 35%. Projections of future climate are generally derived from Global Circulation Models (GCMs) which depict scenarios of what is expected under particular assumptions. Scenarios provide a realistic framework to help identify vulnerabilities and plan adaptation strategies. The following scenario analysis of future U.S. climate, discussed in the next several paragraphs, was developed by the National Assessment Synthesis Team (2000) for the United States Global Change Research Program. Average warming in the U.S. is projected to be somewhat greater than for the world as a whole over the 21st century. Seasonal patterns indicate that projected changes will be particularly large in winter, especially at night. In summer, temperature increases in the South will raise the heat index, a measure of discomfort based on temperature and humidity, significantly. Model projections of precipitation change are in less agreement. Generally, western and northern portions of the nation are projected to receive increased precipitation mainly in the winter. There is divergence of expectation for southern and eastern areas of the nation, however, with some GCMs projecting increases and other indicating decreases. The largest projected decreases are most evident during summer. One very interesting observation can be made from these model projections. There is general agreement that most regions are expected to experience an increase in the frequency of heavy precipitation events. This model projection raises concern over the impact that these extreme precipitation events would have on flooding and erosion which are key issues for agriculture. In the West, the models generally concur that a warmer Pacific Ocean would pump moisture into the region and cause a southward shift in Pacific Coast storm activity. With projected temperature increases, much of the increased precipitation in winter would fall as rain rather than snow, causing a reduction in mountain snowpacks. Winter snowpack is a major source of water in the West for both summer agriculture and hydroelectric power generation. Thus, while wintertime river flows would tend to increase, diminishing snowpacks would reduce summertime flows creating potentially dangerous water shortages in the heat of summer. Projections of soil moisture are even more diverse because any differences in change in precipitation and temperature are accentuated in the soil moisture projections. Model projections generally agree that soil moisture increases are likely in the U.S. Southwest. In the models that project both significant increases in temperatures and decreases in precipitation, substantial soil moisture decreases are common, most notably from the central Great Plains to the East. However, models that project more modest warming and precipitation increases generally result in soil moisture increases over these same areas. Another interesting and important feature of this scenario analysis for agriculture is drought tendencies. Models generally indicate increased incidence of drought, especially east of the Rocky Mountains from the Great Plains to the East. Intense drought tendencies are projected to increase in many agricultural areas of the nation. Both soil moisture availability and drought tendencies will have a significant impact on water supply, the vigor of agriculture, and the health of forests. In Canada, the climate is expected to change with significant regional variations. Long-term (100 years) climatic trends for agriculture were studied for five locations in Canada: Agassiz, B.C., Indian Head, Saskatchewan; Brandon, Manitoba; Ottawa, Ontario; Charlottetown, Prince Edward Island (Bootsma, 1994). A total of 17 agroclimatic parameters were computed on a yearly basis from daily climatic data. The parameters included climatic characteristics of importance to agriculture such as frost dates, growing degree days, temperature, precipitation, potential evapotranspiration and forage aridity index. The climatic attributes were extremely variable, such that detection of warming (greenhouse induced or otherwise) was difficult. Most of the evidence of climatic warming comes from stations located in western Canada. This warming is mainly confined to the growing season and is not apparent in mean temperatures during winter. The temporal variations are not uniform over space. Stations in western Canada indicated trends of increased frost-free periods, growing degree-days and corn heat units. Stations in eastern Canada did not exhibit the same warming trend.